An exquisite residence of distinction beckons in the exclusive Isle of Capri enclave. 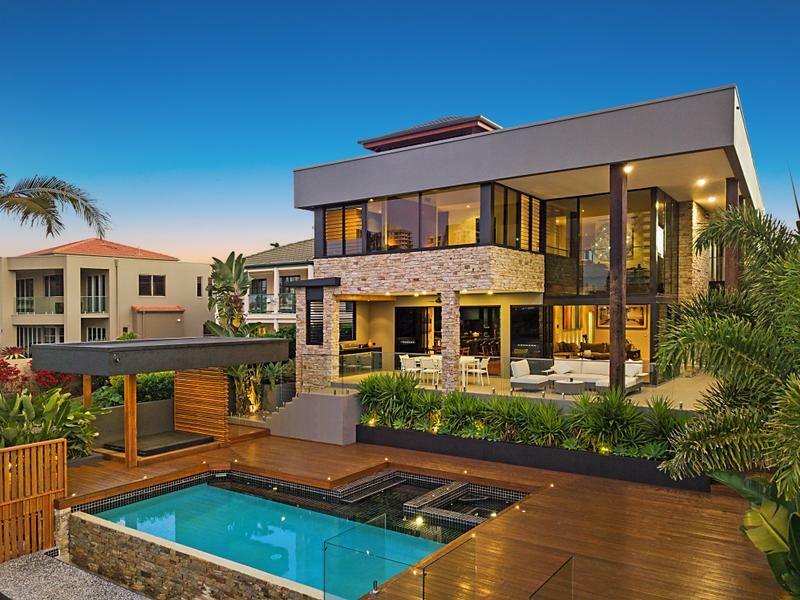 Nestled on a rare sandy beachfront block and boasting one of the most sought-after aspects on coveted Amalfi Drive, this north-east facing, full concrete architectural masterpiece features 816m2 of unrivalled luxury living, with no expense spared and flawless finishes throughout. Masterfully designed to maximise the 685m2 block, celebrity builder Marshall Keen, as known as “The Bondi Builder” (as featured on Channel 9’s hit new series Buying Blind) has harmoniously blended unique architecture, custom-built design and a feat of engineering in bringing this unrivalled and meticulously maintained residence to life. Encompassing 5 bedrooms, 4.5 bathrooms, a private study with separate access, 8-person elevator, multiple enviable entertaining areas and a vast 305m2 basement comprising of a media room, gymnasium and 8 car garage, there is simply no comparison to this iconic property, positioned as a landmark Gold Coast residence. From the specially sourced, historic hardwood timber beams which flank the home, through to the extensive use of exposed concrete, timber and glass finishes, it is evident love is in the details of this intricately and carefully constructed full concrete home which has been designed for the ultimate in family living, entertaining and even the busy executive, with a bespoke office with separate access, set under vast 4m ceilings and with its own powder room. Expect to be spoilt for choice with ample options for hosting family and friends. Indoors, the open plan living room sets the tone for understated elegance, with a gas fireplace nestled into a stone feature wall and a full wet bar on offer. The gourmet kitchen, accented by an American Walnut matte black finish, boasts an oversized Butler’s Pantry, sleek stone benches, acclaimed Miele and Liebherr appliances and flows to the dining room. Here you’ll be easily tempted outdoors to the superb alfresco area. Set against spectacular city skyline and water views, enjoy the custom built outdoor kitchen with 2-pac finishes, decking, a covered dining pavilion, 9m x 5m infinity edge pool with heated spa, plus your private beach and pontoon. Retreating indoors, ascend upstairs via the 8-person Schindler Lift or suspended timber staircase, where two distinct, luxury wings await. The sumptuous master suite is draped against iconic views of the Gold Coast skyline and set under a soaring vaulted ceiling. Light-filled and spacious, it offers a decadent contrast to the ensuite with a deluxe free-standing black bath and also features a generous walk-in-robe. A parents retreat, with a gas fireplace sits outside this inviting space, while the other wing hosts bedrooms 3 and 4, each with walk-in-robes and share and an ensuite and sunny rumpus room. The 5th bedroom awaits on the ground level, with built-in-robes and access to a modern 2-way bathroom. The basement level is also sure to impress. Boasting oversized 3.8m ceilings, this cavernous space can comfortably accommodate 8 cars (including larger vehicles – boats or caravans) and also presents with a fully equipped, tiered media room with CinemaScope equipment and bespoke built-in sound system. Occupying a prime position, within easy walking distance to Surfers Paradise and the boutique Capri on Via Roma dining and shopping precinct, as well as offering easy access to Main River, this is a residence without equal which will afford you a low maintenance, luxurious lifestyle. – Lush, low maintenance gardens and easy stroll to Surfers Paradise and Capri on Via Roma. Proudly Marketed by Nick McHutchison and Michael Kollosche of Kollosche Prestige Agents, Broadbeach Queensland Australia.